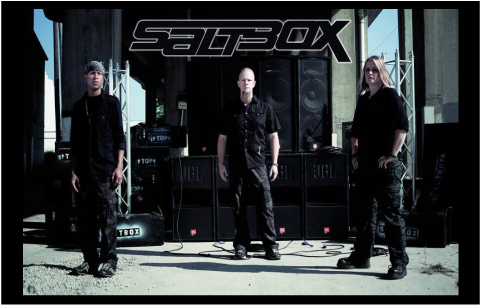 Hailing from Nixa, Mo, SaltBox formed back in 2004 by brothers James & Joel Rees and offer up some serious hard hitting Metal/Hard Rock offerings. As a reviewer, discovering new bands is always a thing of excitement and joy especially when they sound as good as this band sounds. The band went through a few member changes and a couple of name changes before settling on the current name 'SaltBox'. They have two full-length releases to their credit 2008-'Out Of The Box' , and 2012-'The Revolution'. SaltBox is in a good position having reached a couple of milestones. The first came in the Spring of 2008 when the band won the “Lebanon Battle Of The Bands”. This win propelled them to the front of their local music scene and gave them the momentum to launch their debut album “Out of the Box”. Shortly after the release of the album, the band hit their second milestone. In late fall of 2008, SaltBox was featured on the #1 Christian CHR radio station in America. They were matched up against a top 40 new release in a “Spam or Jam” contest. To their surprise and excitement, SaltBox won this event. The band's name is a nice fit with biblical text found in Mathew 5:13 which states: "You are the salt of the earth". An interesting fact about salt is that it not only helps food taste better but it can also help wounds to heal. SaltBox is traveling the country helping peoples wounds to heal with the message of hope that permeates throughout their songs. ​ SaltBox released this statement on their site that helps us to better understand where the band is coming from and their strategy for reaching others: "We understand and accept that. It is our desire to become all things to all men, so that we might win some. To a lot of places we are just a rockin band...for them we rock!!! To others we are a positive role model...we take that responsibility seriously. But to some who are praying for help...we get to be an answer to prayer." In 2012, SaltBox released their sophomore 2012 full-length album 'The Revolution' on the indie record label- 'Pure Music Group'. Even though the band is with an independent record label the production is top notch. SaltBox decided to go the indie rout in order to have more say and control throughout the whole process. With this release, the band has further developed their sound and has established a strong presence in the Metal community. 'The Revolution' quickly gets your attention with the arrangements that take one back to what made 80's Metal great, yet still capturing what's hot in modern day Metal music. Each tune sounds different in its own unique way. The band has also included an impressive Progressive track called "Beautiful Was Her Name" that sticks in your head and shows us a glimpse of what this Nixa, Mo based band is capable of. Lead Vocalist James Rees sings with passion and grit while mixing things up with plenty of hooks to keep you coming back for more. When the Vocals of James Rees are coupled with the backing Death Vocals of Drummer Joel Rees, there's a special dynamic that's released which helps to make this 2012 album great. Guitars are handled by lead Vocalist James "Pops" who shreds more in the traditional Hard Rock style. There are a few moments where the guitar work takes on a slight Thrash like attitude. Our percussion team is comprised of Bassist Athena Rees and Drummer Joel "Beats" Rees. Athena does a nice job on the Bass for SaltBox while doing her part in helping the band have a more full and heavier sound. Joel "Beats" does a great job keeping time for the band and assisting James with backing Vocals. The band's lyrics are all Christ centered and help point us toward our Lord and Savior Jesus Christ. 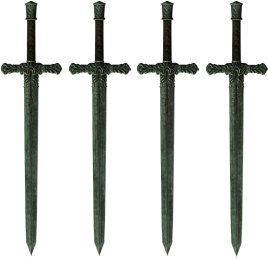 (See Site Info for Sword Scale Meaning)This rating is for the album 'The Revolution'. If you are looking for some more killer Metal music to add to your library then you really should give SaltBox a listen. Some bands that come to mind that are similar to SaltBox are Striken, Five Star Prophet, and Bone Prophet so go ahead and pick up your copy of their album 'The Revolution' and let the shred began.